The Catalyst News BRITAIN GREAT NO LONGER By Pat Griffin There are millions of posters of Braveheart plastered throughout Scotland, the word "Freedom!" emblazoned in large print. Sean Connery is personally bankrolling the most prominent national ist party there. As glamorous as this sounds, it is backed by an almost univer sal will of the people. The Scottish Nationalist Party doubled its membership in parliament in the last election. 90% of Scots voted in the last election for either Mr. Connery's party, (of which he is head only by wallet, not administration), for a third party with a similar agenda, or for the strong new majority party, Labor. All of these support something called "devo lution." This means granting greater autonomy to non-English areas in the United Kingdom, such as Scotland, Wales, and possibly, to one extent or another, Northern Ireland. What is certain, though, is that the Scots are getting a powerful in dependent legislature, and the Welsh a somewhat less powerful one of their own. The Conservatives, who were uncere moniously booted out of office all throughout the United Kingdom, have warned that devolution could lead to the breakup of the union. Scotland and Wales, who totally ejected all Conservative rep resentation inside their borders in the election a few weeks ago, don't appear to have a problem with that. Even in England (which has the most to lose polit ically by such a breakup should it occur) the concept has not generated a great deal of controversy lately. The Scottish parliament will have 129 seats, and will have total control over ed ucation, health and legal affairs in Scotland. The Scottish people will vote in the fall on whether or not this assembly will also have tax powers. The Scots have maintained their separateness in legal code and schooling de facto throughout their more than 300 years of political union with England, with occasional ex ceptions being marked by bloody conflict. The Welsh will get somewhat less vast powers over their own internal matters, but what they do get, like Scotland, will be absolute. They will not be given the opportunity to grant the legislature taxing abilities. The Welsh have become much more integrated with the English than the Scots have, and therefore the pull for autonomy is not as strong. It is still commanding enough, however, to send a clear mandate to the newly-appointed Labor party to grant the assemblies. Those assemblies are Labor's most in ternationally recognized babies, and they show every indication of going ahead with the projects as they have promised prior to election. One interesting issue still left to be resolved is the fact that right now Scottish and Wels h MPs, (Members of Parliament in the UK.) would retain their seats in Commons, and therefore would have control over educa tion and law in England, whereas English MPs would have no say in Scotland or Wales. The other major issue to the devo lution process still left undecided is Northern Ireland. Even there, hopes are high for negoti ations toward some form of separation. The Sinn Fein has gained two important seats there, including one for Party head Gerry Adams, and Labor has appointed Sinn Fein-friendly people to negotiate with them. The biggest rankling point seems to be the British habit of referring to Sinn Fein as the IRA. While Sinn Fein have represented the IRA in political ne gotiations in the past, and probably can speak for them now to a large extent, they both insist that they are not one and the same. With the Labor Party so committed to devolution throughout the British Isles, this slipup is likely to be written off as a matter of tact from a new ruling party. In Scotland, greater autonomy is guar anteed and virtual independence is available for plebiscite in the Fall. A great degree of self-determination is also on its way for Wales. Irish nationalists in Northern Ireland are hopeful for compro mise. What makes these events even more historically earth-shaking is that England isn't balking at any of this. May 13, 1997 3 OUTSIDE THE IVORY TOWER International The death toll is at least 1,000 for an earthquake that hit Khorasan province in Iran on Saturday, and around 5,000 more were injured. The quake struck at 12:28 PM with a mag nitude of 7.1 on the Richter scale, and most of the damage was in the villages and towns between Birjand and Qaen. Iran experiences dozens of tremors every year. The U.S. State Dept. said it is ready to take in 5,000 refugees from Bosnia whose right to stay in Germany has ex pired, and the total may be boosted to 7 ,000, depending on the efforts of German aid programs. Germany took in more than 320,000 Bosnian refugees, more than the rest of the other European Union nations combined. National The House passed a bill by 286-132 on Thursday that would allow juveniles as young as 13 to be tried as adults for federal violations like violent crimes and drug offenses. The bill authorizes $1.5 billion over three years to help states fight teenage criminals, who ac count for the largest portion of all violent crime in America. Clinton said he opposed the Republican measure "because it fails to provide a compre hensive plan to crack down on youth and gang violence." A similar bill is pending in Senate. The FCC has approved reform of telephone industry cost schemes. Among the alterations to the current pricing schemes are that the cost of multiple phone lines to residences and businesses would increase. According to the FCC, basic local phone rates would not change, though the average monthly long distance bills are ex pected to be lower as a result of the FCC's lowering of the long distance carrier access charges to local phone company lines. In addition, $2.3 billion was voted to be set aside help to con nect schools and libraries to the Internet. The Catalyst Entertainment May 13, 1997 5 A PEEK AT THE INSIDER'S GUIDE The following email message was sent to selected New College students a few weeks.ago It really needs no introduction, so read on. ***************************** Dear Student, I am writing to ask for your input on an article I am writing about New College. I am a writer for the Insider's Guide to the Colleges, a nationwide col lege guidebook. It would be a great service to high schoolers, thinking about attending New College, if you could take a moment to read the article below and let me know if there are any factual errors. If you would e-mail me your comments, I would really appreciate it. Thank you very much for your assistance. Blake Rawdin Managing Editor Insider's Guide to the Colleges ****************************** The image of a smoke-filled room crowded with black-clad, angst-ridden teenagers comes to mind when some stu dents describe New College. One student described his classmates as all the kids who didn't fit in at high school. This unique bunch of kids, however, strives for success within the experimental milieu of New College in Sarasota, Florida. New College has an unconventional educational system, one of the main at tractions for its relatively small student body. Instead of following a core curricu lum, students are able to design their own courses of study with the help of a faculty advisor. To further encourage students to pursue their interests in a noncompeti tive environment, the school does not issue grades. According to students, moti vation has to come from within. It only works if you're self-motivated and inde pendent. You need to have a strong sense of self to survive, one student said. Another undergrad reported, Grades don't mean anything to me. In high school, I got As and felt I learned nothing. Now I slack off on day-to-day assignments, but I try hard for the big projects. New College students choose from a variety of estab lished majors or design their own. Faculty advisors suggest graduate school oriented academic programs for those who foresee further education.) Many students agree that the departments are gen erally equivalent in quality. While the faculty does not include national famous professors, students feel the professors are all high-caliber. Class sizes tend to be small; students and teachers are on a first name basis and interact at a familiar level. We go to parties at their houses. They come to our parties, one student said. Students serve on all faculty committees. Outside of classes, New College un dergrads spend a good deal of time studying, with classwork taking priority over extracurricular activities. Students usually study in the main library, the Jane ,_B; COok'Bancroft Library. Although some students say the library is not great, they can take advantage of interlibrary ex change with other Florida colleges and upperclassmen are given their own carrels in the library. Favorite places for social study include the student center, the bay during good weather, and dorm rooms. 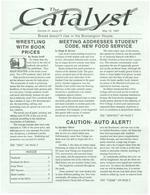 Many students get involved in the student weekly paper, The Catalyst. Others join Amnesty International, or the New College Student Alliance, a student government group, which one member described as a grassroots democracy. Some fault their classmates, however, for being apathetic: A lot of people theorize about politics, but you don't get much di rect action, one said. Although they may not always act on their convictions, stu dents generally consider themselves politically liberal, smart, alternative types As one student said, I can't think of any one here who is conservative. I don't know one Republican. However, another student strongly disputed the Democratic slant on campus, saying, Socialist ideas are very welcome here, but with that comes the freedom to have individual po litical opinions. We are not all the same here Some of the hot issues on campus are gender issues and race. The school has a small but well-accepted homosexual community, and many students participate in an annual dance-a-then to benefit AIDS research While students have diverse in terests they generally come from similar backgrounds: white, upper middle class, and suburban. Most New College students confine their social activities to campus. Walls, parties randomly thrown together when the urge hits, give students ample oppor tunity to express their eccentric side. Cross-dressing is reportedly big at parties. One of the more organized dances is the PCP, or the Palm Court Party, when stu dents tie dye, listen to music, and dance Alcohol consumption isn't exactly con doned at the school, but one student said that cops look the other way most of the time. Town residents often complain about the noise at New College parties, but the town offers few alternatives for student entertainment. The campus has a 70s Spanish feel which is very Florida, one student said. Upperclassmen at New College generally move off campus, but most freshmen and sophomores live in the three campus dorms. Students in B and Viking dorms have single rooms; in Pci dorm, residents share doubles. Each dorm has its own character, but some students consider Viking the least appealing because it's an old converted motel. Another dorm, which will include three-person suites, is still under cons truction Dorm residents often leave their doors open, so their liv ing space is in a sense communal. According to one student, It's like an apartment complex in a strange, abstract way. Security concerns are minimal among students; locking the door is the only security measure most practice. Campus residents eat in one central cafeteria and are required to be on the meal plan. The food is prepared by the Marriott food service. Students also enjoy eating at the Granary, a health-food restaurant, and at Taco Bell. New College does not have a varsity sports program but its athletic facilities include a gym, racquetball, tennis, and basketball courts, a soccer field, and a pool. Students at New College, with its al ternative experimental curriculum and easy-going social environment, are far from traditional, but they share a deep sense of belonging and commitment to their school. According to one student, spirit is high, but it isn't expressed through the usual channels: We don't wave flags or wear colors or anything, but there 's a lot of commitment to the com munity. 6 The Catalyst May 13, 1997 A VACCINE FOR HIV? by Charles Choi On April 29 the University of Pennsylvania (UP) reported that one year ago, two chimpanzees were given a dose of HIV large enough to infect 250 ani mals. But two months prior to that, they were given what is called a plasmid DNA vaccine, and as a result, their immune systems seemed to prevent the infection Vaccines in general make the immune system react with the defensive proteins known as antibodies that only attack spe cific diseases should they ever attack, and some vaccines stimulate white blood cells called "killer T cells" to go and attack in fected cells. Mostly, vaccines do not result in disease themselves, for they only use inactive or weakened versions or components of these diseases. DNA vaccines use plasmids, which are circular loops of DNA molecules that are autonomously replicative. DNA vac cines differ from traditional vaccines, in that they make the body temporarily manufacture germ proteins by injecting plasmids (that harbor cloned genetic ma terial from the germs in question for gene expression) into a small percentage of cells When the immune system encounters these proteins, there i enough informa tion there to trigger a response. The DNA vaccine genes do not become a permanent part of the genetic makeup of the target. DNA vaccines do not seem to carry the potential risk of being infectious, un like the weakened disease forms of vaccines. In addition, unlike inactive component forms of vaccines, DNA vac cines can stimulate killer T cell response. The HIV DNA vaccine used about 75% of the viral proteins from the outer coat and core. Each chimp got six injec tions over 15 weeks, and then two booster shots. Two months after the last booster, the two chimps got dosed with HIV. Researchers found signs of a slight and temporary HIV infection six weeks later in one animal and eight weeks later in the other, but there was no further trace of infection after that, and Dr. David Weiner, lead researcher, said that this was consistent with how traditional vaccines worked. Phase one of the clinical trials on vol unteers already infected with HIV started at UP but no results are available yet. Researchers found no evidence to support initial concerns over the possibility that injected DNA would result in chromoso mal damage or autoimmune diseases In fact, earlier this year, the FDA approved initial tests of the HIV DNA vaccine on uninfected volunteers at the National Institutes of Health. Dr. Kenneth Ugen came to the USF College of Medicine around two years ago from the UP Medical Center, and continues to be an integral part of the DNA vaccine development team, and said, "Some guarded optimism about the development of an effective vaccine against against HIV. We still however, have a long way to go." DNA vaccines should also be able to protect against multiple variants of a dis ease which is critical when it comes to responding against diseases that mutate their surface signatures, called antigens, and thus avoid an immune response And, since they are derived from human speci mens, problems with divergent mutants can be minimized. Preliminary findings in related re search have shown that treatment with the vaccine can also halt the presence of HIV in chimpanzees previously infected. And certain drugs in addition to the vaccine may aid in both antibody re ponse and cell mediated immune response. DNA vaccines should also be easier to manufacture than traditional vaccines, as they are easily manipulated even by high school students for lab classes. The plas mid DNA can be reinjected at times with booster shots in order to refresh and reinforce immune response SHOW US THE MONEY b y Ro bert Knight The SAC has depleted its funds for the year, according to chair Hazen Komraus. He said that the some of the things which drove the SAC over its bud get were repeated hot tub repairs, replacements of silverware and plates in the cafeteria, and reimbursement requests. However, he said, that's no cause for panic. NCSA Co-Presidents Matt Grieco and Martha Alter, Barbara Berggren and Komraus decided to tap the NCSA re serve budget for SAC use Currently, $6,884 remains of the $12, 000 NCSA re serve This is not the CSA's operating reserve, but rather a reserve that usually serves as a buffer for the following year and usually stays up in Tampa, untouched. To make up for these unexpected allocayear end events that the SAC normally funds, such as the Graduation PCP, have all been allocated money. Komraus said that he did not anticipate the SAC having -----------------to allocate more than another few hundred To make up for these unexpected allo cations, Tampa will possibly increase the SAC's funds by $10-20,000 next yea r so that a pinch such as this would be avoided at the end of next year. dollars, and that would probably go to ward extra funds for Graduation PCP (if needed) and dance performances. "The SAC in 1996-97 got $70,000," said Komraus. "We had $I 2,000 reserve -----------------from accumulations that weren't spent tions Tampa might increase the SAC's funds by $10-20,000 next year so that a pinch such as this would be avoided at the end of next year. As of Thursday's SAC meeting, all the over the last few years and we spent all of that this year Officially, the SAC has no more money [for the school year]." go away. this is tbe last ISSUe.